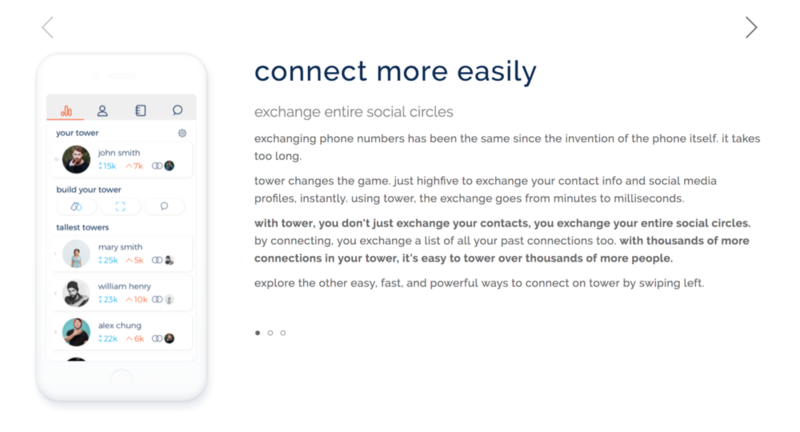 tower, a new social network connecting people by the thousands, needed a website to show how it's impacting connecting as a whole. with it's simple, efficient, and insanely fast approach, 361º created a website that illustrates all of towers features in less than 30 seconds. by laying out the website along an index page, a visitor is able to scroll through the entire website in one smooth motion. this was done to convey the simplicity that tower, the app, also delivers. the first page of the index is actually a carousel. this carousel not only displays every screen of tower but also shows the visitor everything they can do using the app. without even scrolling, a visitor to the website can explore all of it. with simplicity, a powerful new app, and lot to get to in mind, 361º went to work.